Phase 0 (the "upstroke") of the cardiac myocyte action potential is mediated by fast-activating voltage-gated sodium channels, which are preferentially localized near gap junctions (Kucera et al. 2002). The a subunit, Nav1.5, is encoded by the gene SCN5A. The structure of this protein is described by four heterologous domains (DI-DIV), each consisting of six transmembrane segments (S1-S6). Not surprisingly, a nine-base-pair deletion in this linker resulting in a triplet residue loss (AKPQ) is known to confer sustained sodium influx and subsequently delayed repolarization during the action potential, and it is one of the principally implicated mutations in the long QT syndrome variant LQT3 (named for all mutations in the third gene experimentally linked to the syndrome, SCN5A) (Kass and Moss 2006; Moss and Kass 2005). In contrast, reduced Nav1.5 function is a cause of Brugada syndrome (BrS) (Antzelevitch and Fish 2006). PAR-mediated activation of PKA leads to an increased number of functional Nav1.5 channels expressed at the membrane via phosphorylation at consensus sites S483, S571, and S593 in the DI-DII cytoplasmic linker (Zhou et al. 2002). In addition to the PKA-regulation of the Na sodium, SCN5A associates with calmodulin (CaM) and one of its effectors-Ca2+/ calmodulin-dependent protein kinase II (CaMKII) (Wagner et al. 2006). CaM binds to an isoleucine-glutamine ("IQ-") motif on the C-terminus of Nav1.5 and promotes slow inactivation in response to activation by rapid Ca2+ cytosolic influx in the early action potential (Adams et al. 1990). Phase 2 of the action potential, or the "plateau," refers to the period when K+ efflux potassium channels are electrostatically balanced by persistent Na+ influx from Nav channels and Ca2+ influx from L-type voltage-dependent calcium channels (L-VDCC) as the process of excitation-contraction (EC) coupling begins. EC coupling proliferates as the initial increase in [Ca2+]i induces sarcoplasmic reticular "calcium-induced calcium release (CICR)" through the cardiac ryanodine receptor, RyR2, in a feed-forward mechanism that eventually generates the actin-myosin contraction of the myocyte (Bodi et al. 2005). Cardiac L-VDCCs are heterotetra-meric assemblies of a1, a2/§, and P subunits. abrogated by microinjection of Ht31 in cardiomyocytes (Gao et al. 1997). Subsequent studies implicated AKAP15/18 as a scaffold that plays a role in potentiating cAMP-/PKA-dependent Ca2+ currents in HEK293 cells (Fraser et al. 1998). Biochemical and electrophysiological experiments have been used to map an AKAP15/18-L-type calcium-channel-binding interaction to amino acids 25-54 in the AKAP and leucine zipper motif in the C-terminus of the L-type calcium channel a^subunit (Hulme et al. 2002). Based upon this information, the Catterall laboratory has used a synthetic peptide based upon the AKAP15/18 calcium-channel-binding domain to inhibit voltage-dependent potentiation of L-type calcium-channel function in skeletal myotubes. This peptide also has been used to disrupt P-AR-dependent regulation of calcium-channel function in cardiomyocytes (Hulme et al. 2002, 2003). However, a RII-binding peptide termed Ht31 (since it was originally isolated from human thyroid; Carr et al. 1992) that is based upon the RII-binding portion of AKAP-Lbc (which is widely used to inhibit AKAP-RII interactions since it has a relatively high affinity for RII, relative to other AKAPs) also can be used to inhibit PKA-dependent potentiation of L-type Ca2+ channel function (Johnson et al. 1994). These results emphasize the importance of AKAP15/18 in L-type Ca2+ channel regulation by the small, localized increases in cAMP that typically are associated with GPCR activation, suggesting that AKAP15/18-dependent mechanisms might be targeted for therapeutic advantage. 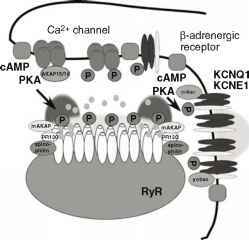 Finally, while most of the literature has focused on AKAP15/18 interactions with L-type calcium channels, there is some evidence that AKAP15/18 can also interact with other ion channels (sodium channel, delayed rectifier potassium channels), P2-ARs, and/or calcineurin (PP2B; Sacchetto et al. 2001), although the putative AKAP15/18 interactions with 02-ARs or PP2B are based upon studies using subcellular fractionation techniques and may not necessarily reflect a direct protein-protein interaction. The role of AKAP15/18 to regulate other components of the 0-AR complex deserves further study. Recent work has also shown that the formation of a Ca 1.2 macromolecular v complex is spatially facilitated by the formation of caveolar complexes stabilized by caveolin-3 that can contain Cav1.2, P2AR (not PjAR), Gas, adenylyl cyclase, PKA, and PP2A all on the same plasma membrane microdomain (Balijepalli et al. 2006). In contrast to heart, in hippocampal neurons, AKAP79 co-targets PKA as well as the Ca2+/CaM-activated phosphatase calcineurin (CaN) to the channel and allows for the two parallel pathways to adjust response. CaN dominantly suppresses PKA phosphorylation and subsequent channel activation in direct response to pulse frequency (not amplitude) of Cav1.2 current. 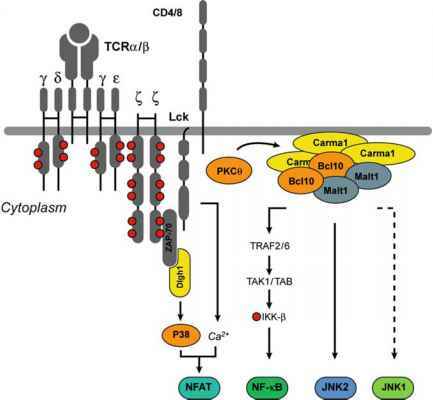 In addition to effects on Cav1.2, CaN was also shown to dephosphorylate NFATc4 and allow its nuclear translocation, whereas inhibition of PKA binding to AKAP79 also partially increased translocation, suggesting that the PKA/CaN axis can also modulate nuclear transduction of calcium signaling (Oliveria et al. 2007).